Gulfstream Park is park is setting the stage for next weekend's PEGASUS WORLD CUP with the SUNSHINE MILLIONS CLASSIC STAKES. Meanwhile, the Road to the Kentucky Derby and Kentucky Oaks continues in New Orleans with the LECOMTE STAKES (KD) and the SILVERBULLETDAY STAKES (KO) at Fair Grounds race track. In total, there are 11 Saturday Stakes races with prize money of at least $100,000. Let's preview the three races with the most consequence: the SUNSHINE MILLIONS CLASSIC STAKES, the SILVERBULLETDAY STAKES, and the LECOMTE STAKES. 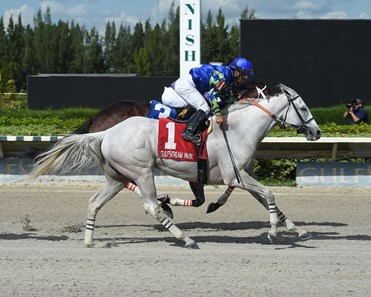 With only two races at 1 1/8-miles on dirt during the current Gulfstream Park meet, the SUNSHINE MILLIONS CLASSIC gives horse players and opportunity to "read the putt" before next week's $9 million PEGASUS WORLD CUP INVITATIONAL race. We'll be keeping a close eye on the pace of the Sunshine Millions Classic and the running style of those horses that finish in-the-money. Eight, Florida-bred four-year-olds will race the 1 1/8th-miles on Gulfstream's main track. The layout of the race should favor inside runners early as the first turn comes quickly after rushing out of the gate. Although many believe two turn races punish front-runners, basically starting in a turn can allow inside speed to build a nice lead with moderate fractions. DALMORE (ML 4-1) has a recent history of 1s across his past performance line. You have to move all the way out to JAY'S WAY (ML 10-1) in the seven hole to find another horse that tries to lead from gate-to-wire. Our handicapper believes both can figure prominently In our pro-subscriber's bonus commentary. "This is another very competitive race. We can make a case for seven horses making their way to the winner's circle. MR JORDAN has the highest, last race speed figure and the highest speed figure for the distance. In our view, he has the most upside. JAY'S WAY seems to need two races before finding his form in race three after a layoff. Today is race three coming off the bench. SOUPER TAPIT has finished in-the-money seven consecutive races. He blew out the competition in his last race, which was his first run at Gulfstream. DALMORE should beat the field to the turn. His lone win in his last 11 races came on the lead. In fact, in his last 10 races, when he gets the early lead he's finished in-the-money three of four; otherwise, not so good." We really don't need to explain the significance of Kentucky Derby or Kentucky Oaks qualifying prep races, other than knowing the winners get 10 points, four points for second, two points for third, and one for fourth added to their tallies. The horses with the most points at the end of "the road" qualify to race the weekend of the first Saturday in May in the Kentucky Derby and Oaks. The SILVERBULLETDAY STAKES winner will be one-step closer to racing for the "lilies for the fillies." Seven, three-year-old ladies will run 1-mile and 70-yards. The distance and surface favors speed as 64% of the 33 winners at the distance/surface were labeled early-speed, with 27% going wire-to-wire. FUN FINDER (PP: 1 ML 12-1), LIORA (PP: 4 ML 5/2) and COWGIRLS LIKE US (PP: 6 ML 9/2) are the horses that will likely press for the lead early on and try to go gate-to-wire. Again, track bias appears to part of our handicapper's analysis as two of the speed trio make the final cut. "LIORA is dropping in class after winning a Grade II stakes race. Trainer Wayne Catalano wins non-graded stakes races at 18%. MANDY BLUE has won both of her races and is making her second start after a short layoff. Trainer Brad Cox wins seconds starts at 28%, non-graded stakes at 27%, and at 29% following a win. COWGIRLS LIKE US has won three in a row at the non-graded stakes level. She made a strong move down the stretch to win in her first start since September 4th. If she gets better in round two, lookout� NEEDS SUPERVISION is a 1/2 length away from being undefeated in three career starts. The only question is the step up in class." Finally, the Kentucky Derby prep qualifier, the LECOMTE STAKES is one of the best betting races we've seen in a while. Fourteen entrants will race 1-mile and 70-yards on the main-track with a 9/2 morning line favorite, PLUS QUE PARFAIT (PP: 12). There is a strong probability that winning exotic tickets will offer handsome payouts. Hopefully, our handicapper's selections are on-the-money. "MR. MONEY had a tough start in the Breeders' Cup Juvenile but still managed to finish fourth and run his best speed figure. A cleaner start should equal a better result. TIGHT TEN also had a rough race in the BC Juvenile, hitting the rail. Prior to his run in with the rail, he finished second in G3 and G2, missing by a total of 1 1/2 lengths. WAR OF WILL took to dirt for the first time in his last race, winning by 5 lengths. Since, he's had some strong workouts and should be ready to come off the bench ready to run. PLUS QUE PARFAIT just missed in the G2 Kentucky Jockey Club Stakes on November 24th. 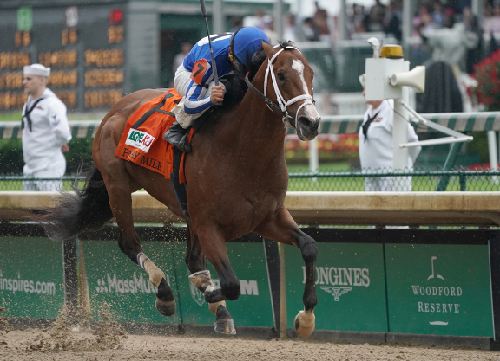 He's never finished out-of-the-money with a win, a second and two thirds in four races." We will be on the ground next week at the Pegasus Cup and have our Pegasus Cup Wagering Guide available mid-week.